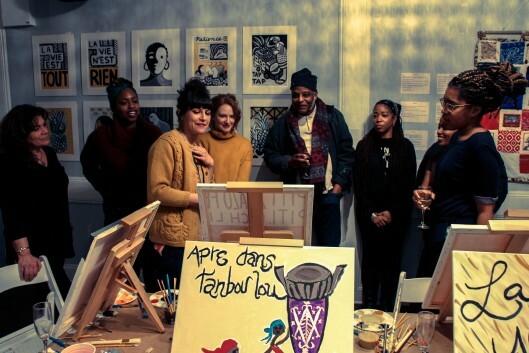 For the series of Black History Month events at Haiti Cultural Exchange, I had the opportunity to lead a Sip and Paint session on Haitian Creole Proverbs. 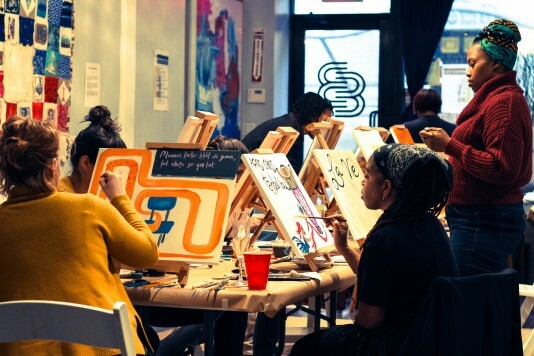 This workshop took place at the cozy Haitian-owned lounge ’33 Lafayette’ in Brooklyn. Haitian Creole Proverbs are very visual expressions that are learned orally from generation to generation. In the Haitian culture, if you want to be well understood, ending your argument with a proverb could easily settle the discussion. During this event, guests learned about a few of those iconic expressions and were challenged to come up with their own visual interpretation. 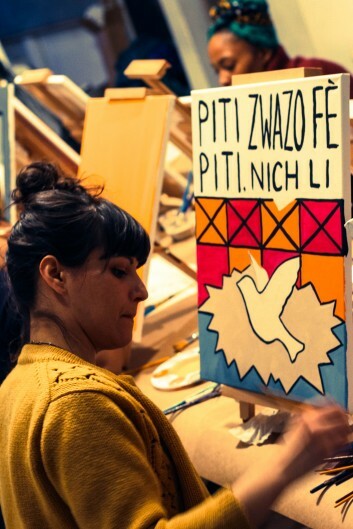 “Piti piti, zwazo fe nich li” = “Little by little the bird builds its nest”, this proverb resonated to one of the guests who had just moved to New York. While she felt that it would take time for her to adapt in the Big Apple, building her nest, step by step, seemed like a wise approach. The proverb “Dèyè mòn gen mòn” = “Mountains beyond Mountains” usually refers to endless challenges in Haiti, but for Erika Pettersen, HCX’s Director of Development and Communications, this proverb could also speak about opportunities. For her painting, she first started with a simple rendition of grayscale hills which became colorful as they reached the horizon. 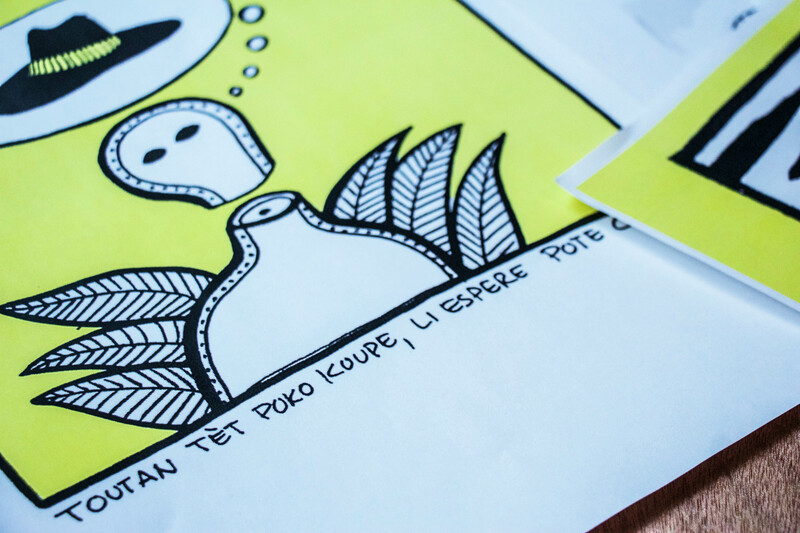 Although most of the guests claimed that they had little visual-artistic background, their sense of composition, their attention and genuine interest for the meaning of those Haitian proverbs resulted in appealing paintings. It was a pleasure for me to work with them and in return expand my own understanding of the wisdom in those expressions. Nathalie Jolivert is a Haitian architect and artist who lives and works in NY. 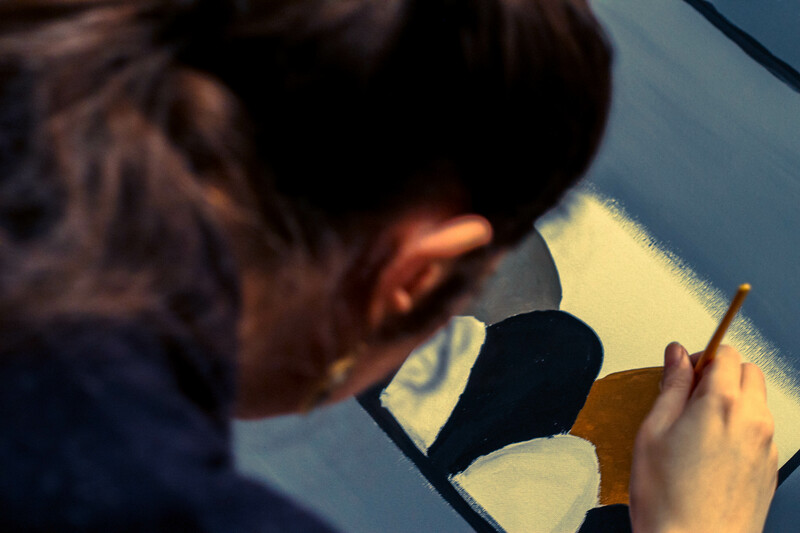 Her art is influenced by her interest in urbanism, environmental issues and human relationships. Nathalie studied Fine Arts and Architecture at the Rhode Island School of Design. This entry was posted on Thursday, March 30th, 2017 at 8:18 am	and is filed under Archive, Arts, HCX Programs, Visual Art. You can follow any responses to this entry through the RSS 2.0 feed. You can leave a response, or trackback from your own site.